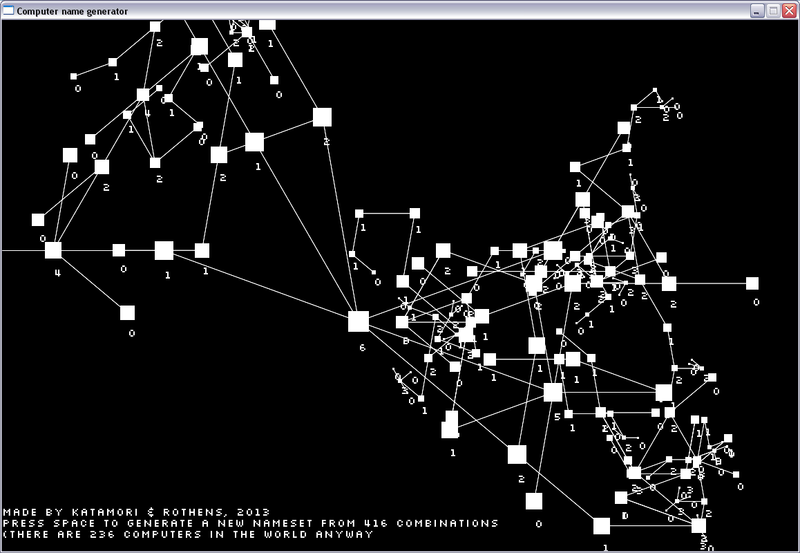 I'd like to create a simple map from vertices and lines - you know, like a usual graph. A tree, to be precise. That's a complete mess! What to do to make it readable? As you can see, I checked, how many ways are going from each single points, but don't have much idea, what to do with them. The problem is that it's impossible to see individual points because their lines cross each other. I want to avoid line crossing at all, like in a usual tree. Force-directed graphs may be use to create a planar graph embedding in which there are no crossings and each individual node is a reasonable distance (depending on your definition thereof) from each of the others. However there is more to this than meets the eye. A planar embedding is distinct from the concept of a planar graph. A planar embedding is simply one representation of a graph, which contains no edge crossings. Consider a bundle of string, with various sections tied together in a complex pattern: If you drop that bundle of string, then there may be an infinite number of ways in which it may lie, once it has fallen... each of these is a separate embedding (arrangement) of the very same graph. However, some graphs are inherently non-planar and so cannot be drawn without crossings... a planar graph is a graph which may, in some way shape or form, be embedded / drawn without crossing edges. Ascertaining whether a graph is definitely planar is hard, because the definition of a non-planar graph is one which contains the Kuratowski subgraphs K3,3 or K5 as minors (not quite the same as subgraphs), and finding / extracting these algorithmically is an incredibly complex process (c.f. Boyer-Myrvold, Fraysseix et al.). However, as you are presumably generating this graph yourself (? ), and in doing so, appear to be generating a DAG (from what I can see of your snapshot), you should never have to worry about introducing either of the dreaded Kuratowski subgraphs. That is to say that without the introduction of cycles, K3,3 and K5 cannot be formed as minors. Alternatively, you may note from the Kuratowski subgraph link above, that Boost contains an implementation of Boyer-Myrvold, if you are using C++ and don't mind adding the library. Also, a Voronoi plane along with the use of Lloyd's algorithm will give you a similar end result to a force-repelled set of nodes, ultimately resulting in a nice, organic-looking graph compare with the 3- and 4-gon approaches. Not the answer you're looking for? Browse other questions tagged algorithm maps procedural-generation tree graph or ask your own question. Good algorithm to generate pixels for thick line?